The Jennie Award is named after Jane Cunningham Croly, the founder of GFWC who worked as a journalist using the pen name “Jennie June.” The women honored with this award are a true reflection of the spirit of GFWC’s founder, whose independence and courage led her to form the General Federation of Women’s Clubs in 1890. As the only award at the Federation level that recognizes individuals for their service, it is truly the highest honor a clubwoman can receive. Much like Jennie June, these women are committed to improving the lives of those around them. They live and breathe volunteer service, and are completely devoted to their clubs, communities, and families. Stay tuned for next week’s blog post featuring Mississippi Valley Region Jennie Award Winner Janice Carter! 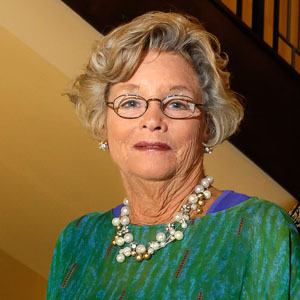 We are proud to announce that Linda Beatty of Boykins, Virginia is the 2016 Southeastern Region recipient of the Jennie Award, a medal of honor given to only eight of the nearly 100,000 clubwomen worldwide. Linda was presented the award on June 28 at the 2016 GFWC Annual Convention in Baltimore, Maryland. Linda joined the GFWC Boykins Junior Woman’s Club in 1967 and is currently a member of the GFWC Tarrara Women’s Club. Linda is a committed leader who is instrumental in town projects and events, including the Boykins Community Calendar Fundraising Project, the Boykins Annual Christmas Parade, and the Christmas Homes Decoration Project. Linda’s leadership has allowed the community calendar project to become the club’s biggest fundraiser, with the latest edition bringing in a net profit of over $1,700. In addition to spending long hours each year laying out the calendar and organizing the anniversaries, birthdays, meeting dates, and more, Linda has dedicated the calendar to the town’s history and founders by adding pictures and historical trivia. Thanks to Linda’s dedication, the club provides multiple scholarships and donations to organizations in the community. “Her club work itself has shown unending dedication to many projects and activities that she wholeheartedly embraces. Linda truly Lives the Volunteer Spirit in all aspects of her life,” said Victoria Edwards, president of the GFWC Tarrara Woman’s Club. In 1982, Linda became the first woman on the Boykins Town Council and has served every term but one ever since. Her leadership helped break the glass ceiling in her town and paved the way for other women to serve, as today’s town council is composed of mostly women. Linda has served multiple times as Vice Mayor and is committed to promoting Boykins, a town of 600 residents in Southeastern Virginia, as a great place to live. “She has seen both the ups and downs of small town life and is not afraid to voice her opinion when difficult issues arise, often managing to sway decisions to an acceptable compromise,” Victoria said. Linda has demonstrated her commitment to GFWC by eagerness to assume leadership roles, such as Virginia State President from 2002-2004 and a member of the Credentials Committee from 2006-2008. She is a shining example of someone who lives GFWC’s mission every day.